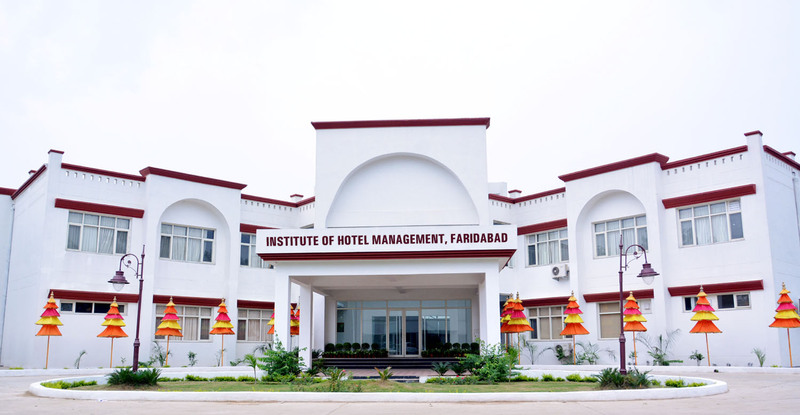 Institute of Hotel Management, Faridabad invites applications from boys & girls for admission to the job oriented 1 ½ Year Diploma courses in Food Production and Food & Beverage Service. Food Production and Food & Beverage Service are aimed at providing professionals for Hotels & Resorts; Railway Catering; Shipping & Cruise Lines; Airlines (on-board & on-ground); Restaurant Chains; Hotel Management Institutes and several other opportunities in other service sectors. The courses are offered by NCHMCT. Pass in 12th of 10+2 or equivalent with English as one of the subjects. Students who have appeared in the 12th examination in year 2019 are also eligible to apply. 25 years in case of General / BC / OBC / Open / PH candidates. 28 years in case of SC / ST category candidates. As per the Haryana Government rules. Click here to download Application Form. Duly filled in application form be forwarded to the Principal, Institute of Hotel Management, Badkhal Lake Crossing, Faridabad – 121 001. (Telephone 0129-4052466) along with fee of 550 (450 in case of SC/ST Candidates) through demand draft drawn in favour of Institute of Hotel Management payable at Faridabad. Application Form can also be obtained from the O/o the Institute against payment of 500 ( 400 in case of SC/ST Candidates) in person or 550 (450 in case of SC/ST Candidates) by post. Candidates are shortlisted on the basis of marks obtained in qualifying examinations. Number of candidates short - listed for personal interview will normally be three times the number of vacancies. Personal interview is held with a view to determine candidate's interactive ability and level of general awareness. Marks obtained by candidates are clubbed with the marks obtained in qualifying examination to finalise the selection list. Candidates finally selected for admission are intimated on the same day. Candidates who are finally selected as per the prescribed procedure will be admitted on payment of the first term fee immediately on declaration of selection list failing which their selection will stand cancelled. Admission will be on first come first basis. Candidates applying for admission are required to submit a physical fitness certificate from a Registered Medical Practitioner as per the prescribed format given in the Information Brochure. Admission to the course will be granted only if the candidate is found to be physically fit for pursuing the course of study. Fee is payable in advance, which is non-refundable except the caution money. 1st term fee is payable at the time of admission. 2nd term fee is payable in December. The institute can revise the fee at any time. The same shall be applicable to the enrolled students. Hostel charges are non-refundable except of caution money. 1st term charges are payable at the time of admission. 2nd term charges are payable in December. Hostel charges can be revised without any prior notice, and shall be applicable to the hostellers. Note: Hostel will be alloted on yearly basis. Copyright © 2014 Institute Of Hotel Management, Faridabad. All rights reserved.